Steve Jobs once said, “It’s not the consumers’ job to know what they want.” I suspect that automakers were thinking like Steve Jobs when they gave us the cup holder. From Popular Mechanics, November 1950 at boingboing.net. A tough device to perfect, the cup holder is still evolving. Engineers have to consider “stirrup mechanics” and “g-force resistance,” the Big Gulp, juice boxes, coffee mugs and Cheetos in a cup. As for location, the dashboard is valuable real estate. Place the cup holder anywhere along the front dashboard and you block access to the radio or the heat or some other button or knob. As a result, many of the earliest cup holders hooked to the car door. 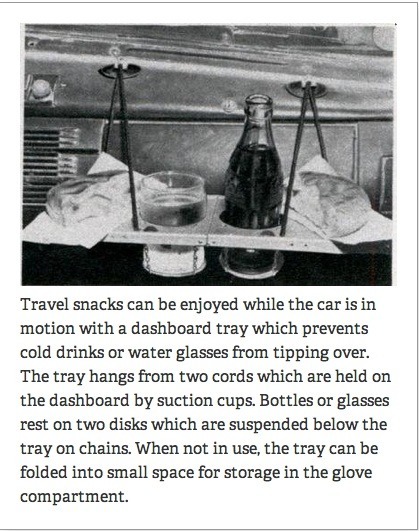 Or, in the 1955 Chevy, the “cup holder” was just 2 indentations inside the glove compartment door. Early glitches included the 1998 Cadillac Seville cup holder that prevented the driver from shifting into lower gears. Because the Jaguar XJ had no cup holder, its sales reputedly sagged. And BMW was famous for avoiding cup holders until consumer pressure reversed their condescending attitude. If we had a cup holder hall of fame, though, the Dodge Minivan would have been the first nominee. Designed by an engineer who says he gathered more than 100 cups, cans, bottles and boxes as he tried to figure out the ideal cup holder shape, the cup holder in his 1996 Dodge Minivan increased sales. In fact, one 11 year-old Autobytel survey that probably is still accurate says 27% of all car buyers will switch brands because of the cup holder. The numbers suggest that we care as much about our cup holders as our engines. And that takes us back to innovation. As with Apple, sometimes an innovation that we never knew we wanted can become a necessity. Sources and resources: While dependable facts on the history of the cup holder were tough to find, the articles were fun to read, especially this recent WSJ piece on “smart car storage.” Design scholars like Henry Petroski have commented on the cup holder, there are old articles here, here, and a picture here, there was a NY Times column that provided somewhat of an overview, and here you can read that in 2002 we ate an average of 15 meals a year in our car (How did they figure that out?). Still though, perhaps we can just depend on ourselves. Don’t you check out the cup holder when you consider a new car? Previous ArticleThe Natural Resource Curse: Detroit? Next ArticleEntitlements: A Baby Boomer Crisis?